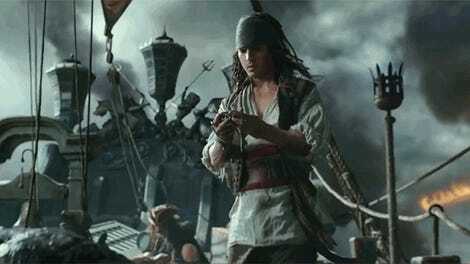 Like the ocean it takes place on, the Pirates of the Caribbean franchise has had plenty of ups and downs. These metaphorical seas have been so rough, in fact, that some people don’t even remember there was a fourth film in 2011, On Stranger Tides, even though it grossed a billion dollars worldwide. I’m happy to say the fifth film, Dead Men Tell No Tales, is probably the best film in the franchise since the very first movie... even though that’s not a particularly high bar. The main reason things work is that directors Joachim Rønning and Espen Sandberg take the franchise back to basics. It recaptures much of what we all loved about this franchise way back in 2003: the swashbuckling action, humor, romance, and that amazing orchestral theme. It also helps that while some of the previous films have pushed three hours in length, Dead Men Tell No Tales is barely over two. It tells a much simpler story with a strong emotional core, complete with a dastardly, scary villain. The biggest problem is, despite Dead Men Tell No Tales being so streamlined, it often ends up feeling like it’s still padding its story out. Things start well enough. A young boy named Henry is hellbent on saving his father Will Turner, Orlando Bloom’s character, who was dammed to the sea a few films back. Henry swears he’ll do whatever it takes to save his father from his curse. Later we’ll meet Carina (Kaya Scodelario), who has similar desires. The child-questing-for-his/her-parents is a standard fantasy story, but it’s an emotionally solid one, which is why it’s so ubiquitous. It makes it easy to invest in both Henry and Carina, despite being all-new characters. Carina (Kaya Scodelario) and Henry (Brenton Thwaites). Nine years later after the prologue, Henry is grown up (played by Brenton Thwaites) and still on his quest. 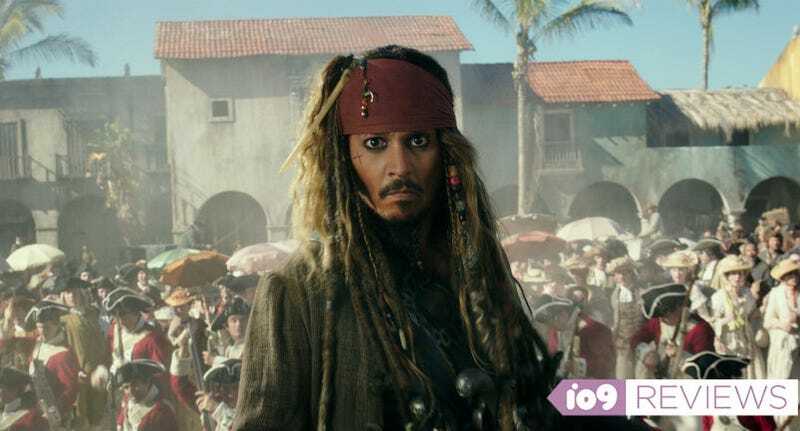 He believes the only thing that can break his father’s curse is the mythic Trident of Poseidon and the one person who can help him find it is dad’s old friend, Jack Sparrow. Johnny Depp returns to what’s come to be his signature character, and though he’s still entertaining to watch, he never quite feels like he fits into Henry’s story. He’s still dumb old Jack, chasing money and women, with little to no sense of empathy. Henry is also driven toward Jack when he meets the evil ghost pirate Captain Salazar (Javier Bardem)\, who’s looking for Jack. Henry meets Carina, who is also after the Trident. There’s even the reappearance of Captain Barbosa (Geoffrey Rush), who also inserts himself into the story. All of these story beats work to keep the film moving, but also push the focus away from the emotional core of the film. More grievously, a lot of it feels much too coincidental. Salazar’s ship eats other ships. And it’s awesome. 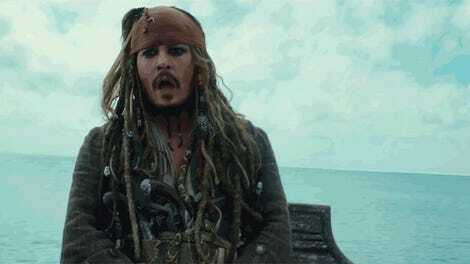 There’s an engaging flashback with a young Jack Sparrow, which explains both Salazar’s hate for him and Jack’s origin. Carina’s passion for science sets up some telling exchanges. Plus, you can’t have Johnny Depp, Javier Bardem, and Geoffrey Rush on the screen in these crazy elaborate settings and not marvel at their talent. Bardem, in particular, is a very fun villain, and a worthy antagonist for the film. Pirates of the Caribbean: Dead Men Tell No Tales opens May 26.